Derailleur hanger for Look model 586 years from 2009 to 2011, aluminum 5086 CNC machined Made in Italy. 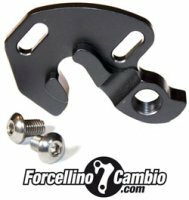 Derailleur hanger for Look model 595 years from 2005 to 2011, aluminum 5086 CNC machined Made in Italy. Derailleur hanger for Look model 596 year from 2011, aluminum 5086 CNC machined Made in Italy. 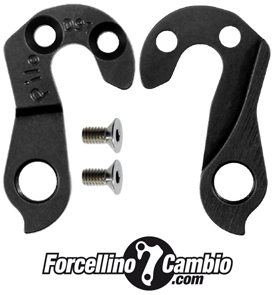 Look KG 461 derailleur hanger 6061 T651, made with CNC technology. Black anodized. Lighter and more durable than the hanger series. Derailleur hanger for Look model Pro Team year from 2010, aluminum 5086 CNC machined Made in Italy. Look 271 derailleur hanger 6061 T651, made with CNC technology. Black anodized. Lighter and more durable than the hanger series. Look 486 derailleur hanger 6061 T651, made with CNC technology. Black anodized. Lighter and more durable than the hanger series. Look 566 2014 derailleur hanger 6061 T651, made with CNC technology. Black anodized. Lighter and more durable than the hanger series. Look 585 2005 derailleur hanger 6061 T651, made with CNC technology. Black anodized. Lighter and more durable than the hanger series. Look 585 2010 derailleur hanger 6061 T651, made with CNC technology. Black anodized. Lighter and more durable than the hanger series.